If you need to generate cash quickly, and you don’t think you have household items which would have value sufficient enough to be used as collateral in a pawn loan, you may be overlooking the valuable wrist watch you’re wearing right now. In addition to accepting many other items of value, we are always happy to arrange for a wrist watch pawn loan in Mesa, Arizona at our store, where our motto is ‘the most amount of money in the least amount of time’. You may have some valuable collector watches that were passed on to you by relatives, and which you have forgotten about because they were tucked away in a jewelry box, somewhere out of sight. Some of these collectible watches can have tremendous value, because of the time period they were manufactured in, because of the precious metal content in their composition, or because of the uniqueness of their construction. 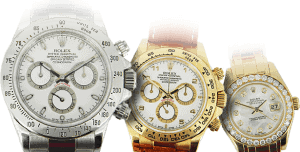 If you think you may have one or more watches like this, by all means, contact our wrist watch pawn shop in Mesa, Arizona to ask for a free estimate of their value. This of course, would only be a ballpark guess, and you would need to actually bring the watches in for an accurate appraisal by our in-house jewelry expert. What can also greatly heighten the value of your watch loan is having the original box and paperwork, possibly even the purchase receipt as well. This allows us to know the authenticity of the watch is real, and also know that you’re the original owner and purchaser of the watch. At that time, depending on the type of watch it is and some of the other factors mentioned, we would put the maximum amount of money in your hands, and write up a no-hassle pawn loan agreement which would have an initial duration of three months. During that time, you would pay monthly installments which include an interest component and a principle component, and by at least paying the interest amount each month, you can be sure of maintaining your loan agreement in good standing with us. Of course, it would definitely be to your advantage to pay down the principle as well, so that you can resume ownership upon completion of the agreement. We are especially interested in fine designer watches such as Rolex, Cartier, Patek Philippe, and Omega, but your fine wrist watch doesn’t necessarily have to be from one of the major wrist watch manufacturers. Keep in mind also that your wrist watch will have greater value if you can bring along the original box it was sold in, as well as the invoice or bill of sale, and any documentation verifying its authenticity. This saves us a lot of time, and can make your wrist watch pawn loan transaction proceed much more quickly, because we don’t have to research authenticity. We Serve All Citizens No Matter What! If you live anywhere in the neighboring communities of Scottsdale, Apache Junction, Gilbert, Chandler, Phoenix, Tempe, or other cities and towns nearby, we urge you to make the drive in to our Mesa, Arizona pawn shop store, to receive an accurate and fair evaluation of any wrist watches you may have. The only requirement is that you are the sole legal owner of those watches, so they can legally be used as collateral in a pawn loan agreement.